12 strand wiring harness connector for 12 volt power systems in caravan and motorhome. 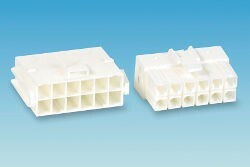 Connector includes both plug and socket so you can make up your own wiring loom with upto 12 cores. A Zig unit can be fitted to a caravan to give a 12V supply to power 12V lights, water pump heater, and sockets and charge your leisure battery when the caravan is connected to a mains 230V AC supply.